Loci Company - Book Preview - Steam Cooking - healthy foods with natural tasteIn the movie "Maid of Honor", Patrick Dempsey and Michelle Monaghan share a common interest in steamed food because it is healthy. In the movie "Maid of Honor", Patrick Dempsey and Michelle Monaghan share a common interest in steamed food because it is healthy. In southern China, cities and towns near the sea where fresh seafood and other farm stock are abound, steamed food has been enjoyed by many generations. Various sauces, pastes and pantry items are added to a dish for variety. Steamed fresh shrimps, spare ribs with plum sauce, and saucy chicken wrapped in lotus leaf are delicious and easy to make. Steamed dishes created in northern China include steamed pork dumplings (soup-filled), and ShiziTou (pork) meatballs. These delicacies take some patience and labouring in the kitchen. If you would like to only enjoy the food without making it yourself, it is not a problem. Today, many of these steamed food can be found in Asian noodle shops or restaurants. For those who might prefer to eat at home, most of these foods can be found in the frozen food section in supermarkets. All one need do is to spend a few minutes to steam them up in the kitchen. Steam cooking, pan searing, stir-frying and deep-frying are the four most common techniques in Chinese cooking. Even for the same seafood, meat or vegetable, its taste and texture differ depending on whether it is steamed, pan-seared, stir-fried or deep-fried. Take chicken for example, you can steam, pan-fry or deep fry it for different tastes. The selection of which method to cook should be based upon whether it can help bring out the best of the meat or vegetable. A general rule in Chinese cooking is that steam cooking is the first choice for very fresh ingredients. Seafood, chicken and some root vegetables are commonly seen in steamed food. Steam cooking is healthy because it uses moist air instead of dry air to cook. Although frying or roasting creates a crispier texture, however, a lot of the natural goodness of the food is also lost after cooking. 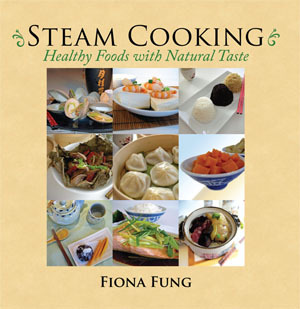 Steam cooking can be done either using a wok, a steam boiler (with steamer basket inserts), while making pot rice (see pages 66-69), or using a microwave oven. While the choice of materials and the right amount of steamed time are crucial to make a tasty dish, you don't need to be an expert! Many steamd dishes can be done in minutes using simple sauces and common ingredients. Steam cooking is energy efficient. Compared with at least 20 - 30 minutes while using a conventional oven, most seafood or light meat dishes takes less than 10 minutes to steam cook. This is in part due to the use of a smaller utensil, e.g., wok or steam pot, than an oven which may be three or four times as big. If we roast potato pieces in an oven under 400 deg. F, it will take from 20 to 25 minutes to cook. However, the same potato pieces may take only about 13 - 15 minutes to steam cook. Best of all, multiple servings can be cooked at the same time by stacking up the steamer baskets (p. 12) in one wok! All great cooking starts with proper preparation. Clean and pat dry seafood or meat before applying marinade. Not only does a marinade add flavour, it also enhances aroma and can be used to seal moisture inside the meat or seafood. A combination of various sauces, herbs and paste; sesame oil, cooking wine, oil and cornstarch are often used as marinades for steam foods. How long does meat or seafood take to marinate? Unlike meat that takes at least 10 hours to marinate before barbequing or grilling, fresh seafood or thinly sliced meat require only a few minutes to marinate before steam cooking. For meat slices that are thicker than 1/2 inch, or for those that have been kept frozen for a while, one should at least marinate for 3 hours, for best results. Meat and poutry need marinades ore than seafood. Vegetable or rice requires little or no marinade at all. A general rule for applying marinade is that "less is more". Fresh Seawater Fish, Crab or Lobster are quite tasty on their own by steam cooking. No special marinade is required. Clam, Oyster, Lake-Water or River Fish can be dressed with sauces and pastes to create various flavour for steam cooking. Chicken - Sesame oil sugar, soy sauce, ginger cooking wine and rose cooking wine or Shaoxin cooking wine. Glutinous Rice - For salty dishes, use soy sauce, oyster sauce, Hoisin sauce and oil to marinate, For sweet dishes, use brown sugar and oil as marinade. Keep an eye on the time when steaming this dish. Salmon fillets are most tender and delicious when they are slighly undercooked. The hot oil caramelizes the salmon and brings an aromatic flavour to the dish. 1. Turn stove on medium high and begin making a wok of boiling water. Water should start boiling in about 7 to 10 minutes. 2. Place salmon fillet on a heat-proof dish, skin side down. 3. Add the shredded ginger and one-half of the spring onion on top of the salmon. 4. When water is boiled, cover wok andsteam the salmon fillet over medium high heat for 7 minutes. 5. At about 1-1/2 minutes before the salmon finishes steaming, pour corn oil or peanut oil into a small saucepan and cook over medium high heat for about 1 minutes or un til oil is sizzling hot. Turn off stove. 6. At the 7 minutes mark, turn off stove and open wok cover. Drain off any excess liquid. Then add the remaining spring onion on top of the salmon fillet. 7. Pour the hot oil and then soy sauce over the ginger, spring onion and salmon fillet. 88-page quality full-color with 27 family recipes @C$24.50 ea.